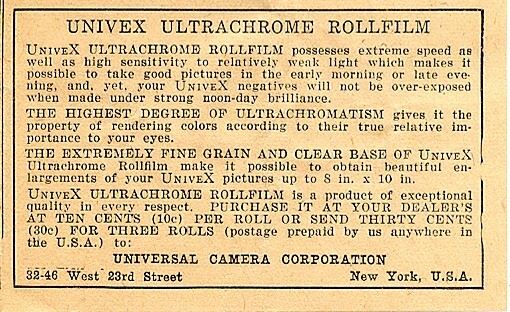 This is a box of unused Universal Camera Corporation Ultrachrome roll film with an expiration date of December, 1949. Univex brand cameras were manufactured and marketed by the Universal Camera Corporation of New York, USA. 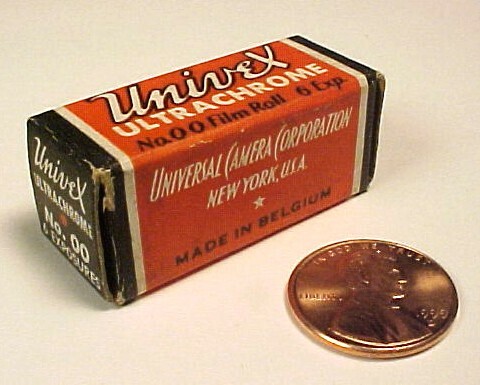 Univex Ultrachrome film was manufactured by Gevaert of Belgium, and sold by Universal Camera Corporation for use in Univex cameras. No. 00 roll film delivered 6 exposures per roll. An ad for Univex No. 00 rollfilm from the Univex A camera instruction sheet. Follow this link to see a Univex AF-2 camera. A navigation frame with links to other pages on this site should appear on the left of this page. If it is not there, click HOME to make it appear.